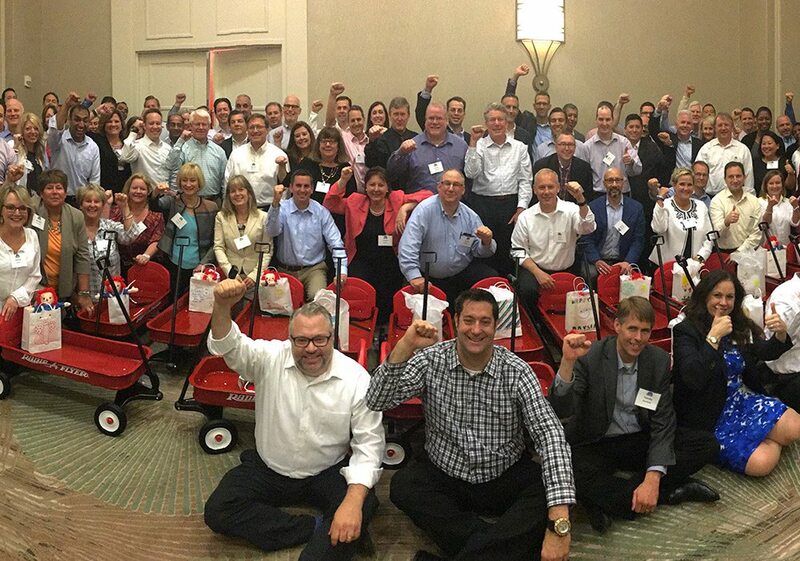 Wagon Build Donation™ is one of our corporate giving programs that directly benefit kids. This one is dedicated to the younger children in America who are just learning about life. 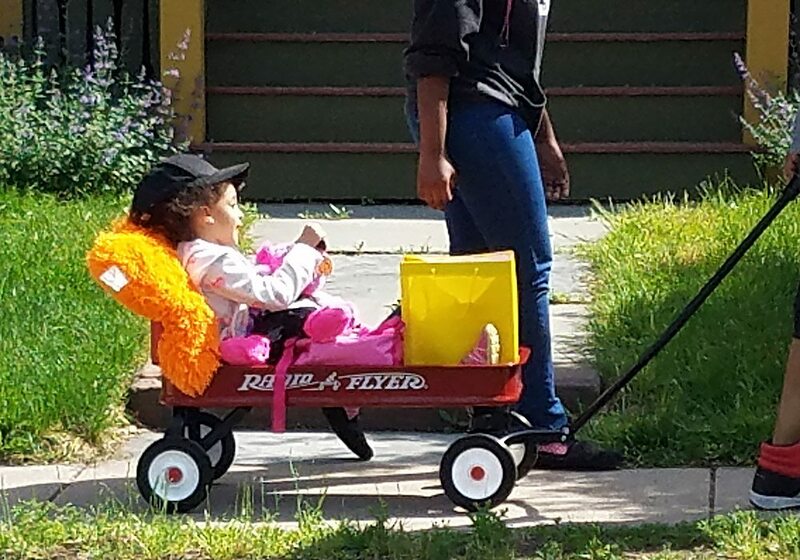 Wagons are a great learning tool for preschoolers, teaching them coordination skills, imagination skills, social skills and much, much more. Your group will be tasked with building full-size, Red Steel Radio Flyer® Ranger Wagons with a rear seat back for added comfort and a seatbelt for added safety! 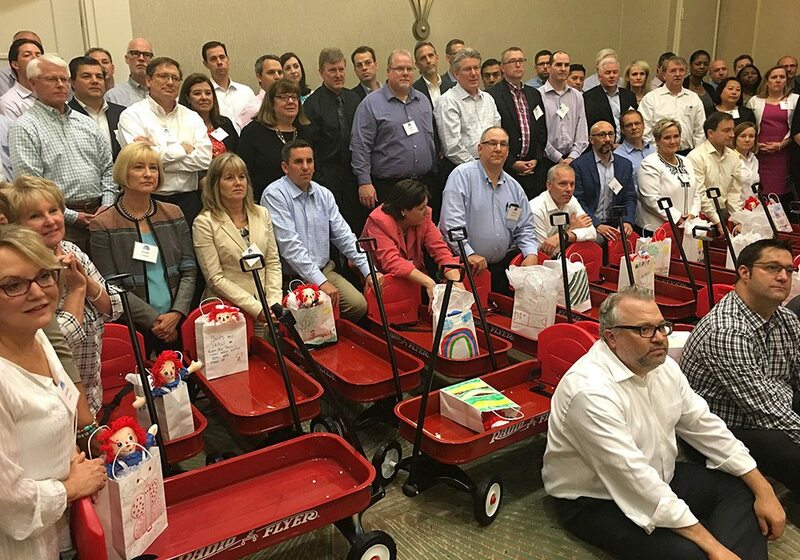 These beautiful wagons are guaranteed to put smiles on the faces of the underprivileged children receiving them. 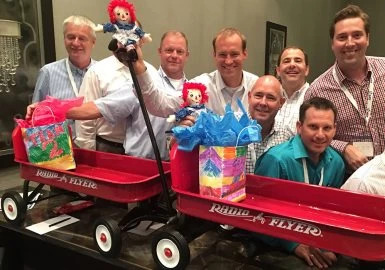 You’ll also be making stuffed animals to accompany each red wagon you build, giving each child a friend to share their ride. You will also be including a copy of New York Times bestseller Renata Liwska's children’s book, the Red Wagon, an imaginative book for the youngest of readers. 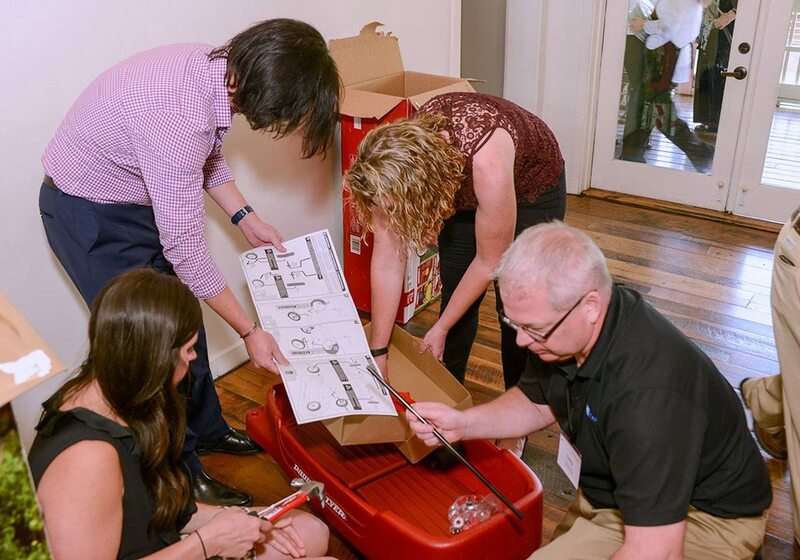 To build the wagons, you’ll need all the pieces, the handle, the wheels – and, of course, the tools! But we are not just going to give them to you, you'll have to earn them by solving puzzles, answering trivia, and memorializing photo and video challenges on iPads® we provide. You’ll score points for every activity your team completes which will be displayed on your iPads – and points are what you need to buy the tools and parts for the wagon build and stuffed animal assembly. After all the wagons have been built, teams will gather for a group photo. Scores will then be tallied and award medals presented to members of the winning team! Your group will walk away feeling energized and hopeful when you see the effects of this heartwarming program. It will drive your passion and lift your energy when a representative from the local Charity shows up to personally thank you and your group for your generous donation. To ensure a great experience, aspects of this event may be modified for your group size, group makeup, time available, and other variables. 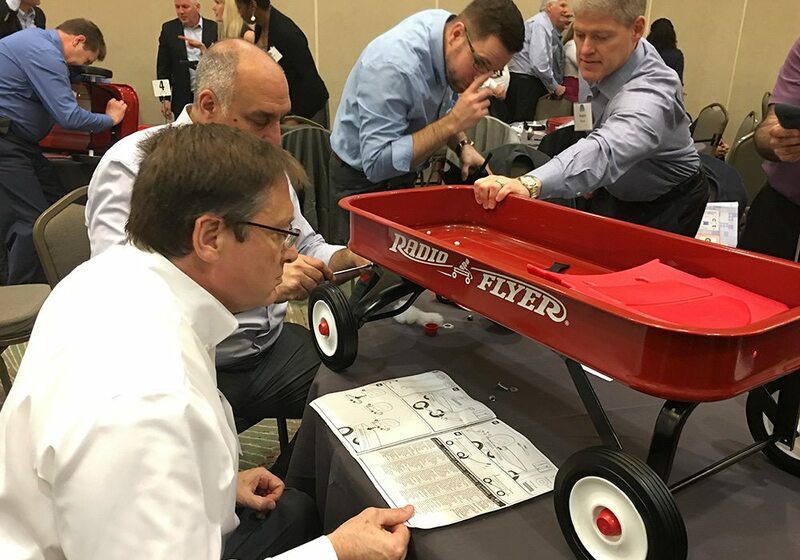 The Build-a-Wagon program was an excellent opportunity to help the community while having fun with teammates we care about, and depend upon every day.” We spend so much time working indoors on difficult projects, it was nice to get outdoors, enjoy ourselves and make something to benefit young children. 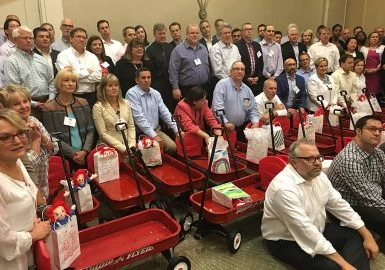 Our Wagon Build Donation with iPads was really well organized. The best team building aspects were the photo and video challenges. 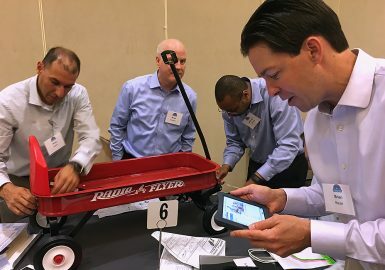 I thought the most fun was the trivia questions and photo challenges on the iPads. We loved all the activities and the charitable aspect of the program. Everyone had a great time! It was fun having members of our different business units working together to accomplish the same goal. We had a number of new employees and I think this was a great way to get people to know each other, working as a team. I think everyone enjoyed the "game" portion of the activity as well as the actual wagon build. They had a lot of fun going through the paces to earn points for the building parts. The event was super organized and our lead kept the group in order and under control. The program was highly received by everyone and the charitable aspect was a huge hit. 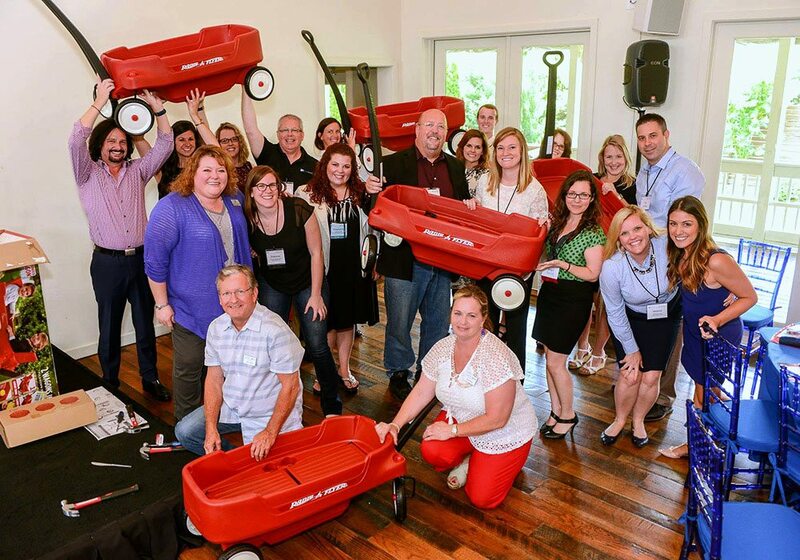 Pricing varies depending upon the number of participants (minimum of 30) and includes Radio Flyer® full-size, steel red Ranger Wagons, animals to stuff and copies of the of New York Times bestseller Renata Liwska’s children’s book; Red Wagon, the team building program, prep, production coordination and all materials, iPads, program design, a professional lead facilitator and staffing.